If you've used any type of body cream or lotion and looked at the ingredients, you have probably seen "Shea Butter" listed somewhere in the product. Shea butter is a well-known deep moisturizer that contains Vitamin A, E, and F and does not clog pores. This is why it's used in so many products. But why use a lotion with a bunch of ingredients and chemicals when you can use just pure, unrefined shea butter? 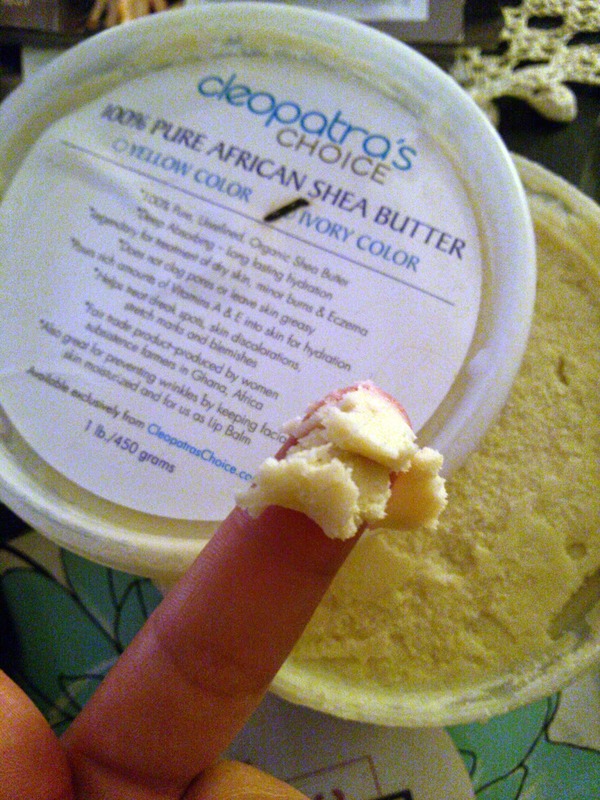 This shea butter by Cleopatra's Choice is 100% natural and organic. It is a fair trade product, produced by women subsistence farmers in Ghana, Africa. It comes in a large resealable one-pound tub. The butter itself is thick at first but then melts with your body heat once you start rubbing it in. A little really goes a long way - a little dime or nickel-sized amount covers my legs really well. I keep the tub by my bedside to apply to my legs and feet before bedtime. It moisturizes better than any other lotions I have used, and the moisture lasts a long time. At first there will be some residue on your hands, but after it absorbs, it doesn't leave a greasy feel. Aside from just dry skin, shea butter can help with eczema, psoriasis, acne, dark spots, and stretch marks. It's also great for using in DYI soaps and lotions. Recently I made a 3-ingredient moisturizer using shea butter, tea tree oil, and coconut oil. It works really well on my face and neck. But the plain shea butter is my preference for legs, arms, feet, and body.